I don’t keep track of how many charges that I get dismissed or give statistics on any kind of success rate and here’s why. Contact me today about your case, and I will get all the facts and go over your defense options. Asking a lawyer about their success rate is the wrong question to ask. Let’s talk about that. Hi, I’m Andrew Flusche. 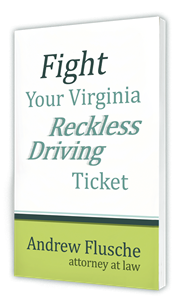 I’m your Virginia traffic and DUI attorney. When I talk to a potential client about your case, what we do is we analyze the facts of your case, you can tell me about what happened, you can tell me about your driving record, and I’ll find out about your history with driving and whatnot, so I can give you an idea of what’s the likely outcome for your case. I’ll discuss with you the judges, the prosecutors, and all the players involved in your case, and how we can hopefully get to the best possible outcome. The natural next question for some people is, “What’s your success rate?” People are trying to figure out how likely is it that they’re going to get the outcome that I’m talking about and do I do a good job for folks. It’s a great idea. You want to understand who you’re going to hire and make sure that you’re hiring the right person for your case. The problem is that the success rate is the wrong question to ask. That’s the wrong way to analyze who is the best attorney for your case. I’ve got other videos where I explain basically, that success rates can be misleading, and they can be purposefully manipulated. It’s a sad truth, but if I pick the correct cases to handle for a couple months, and only take the easy cases where I think they’ll be likely to be dismissed, I could perhaps have 100% success rate of dismissal, then I could publish that and say on these two months I had 100% of reckless driving cases dismissed. Then I can go back to taking normal cases, the wide variety of cases where some people’s won’t be dismissed. I’m not saying other attorneys do that exactly, but it’s certainly a possibility that they can be manipulated. The other important thing is you don’t know where your case fits in the success rate. If someone publishes that they get 98% of reckless driving cases reduced, you don’t know if your case fits in the 98% where it’s likely to be reduced, or if it fits in the 2% where you’re likely to get the hammer from the judge. That’s why the success rate doesn’t really help you, with your individual case, figure out who the best attorney for your case is. What I think is most important for analyzing your choice of attorneys is to contact me. We’ll talk about your case, and you can just decide if you feel comfortable with me. If you think I’m an honest person, which hopefully you will, and if you think that I’m going to do the best job for you that I can, which I definitely will. The more important thing you can do is you can look at reviews from real past clients and see how those actual people felt when they worked with me. You should do the exact same thing with other attorneys. I wouldn’t want you to hire me right off the bat without having looked at some of my competitors. I want you to do your homework and figure out who the best attorney for your case is. I think that you’ll find that I’ve got tons and tons of five star reviews, and I think that I can earn your business based on our consultation and how we treat you as a person when you contact my office. I don’t think the success rate is the way to approach the case, because again, that can be misleading and it certainly doesn’t tell you what you need to know about how I’m going to handle your particular case. If you have a case in Virginia where you need my help, please contact me so we can discuss your case together.